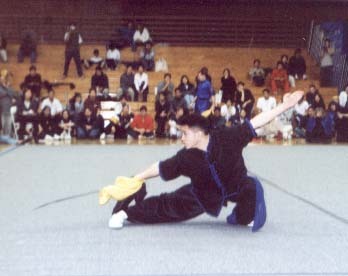 February 12th, 2000 marked the 4th annual Intercollegiate Wushu Championships, the yearly competition bringing together college students from across the US for competition, friendship and sharing a passion for all styles of Wushu. 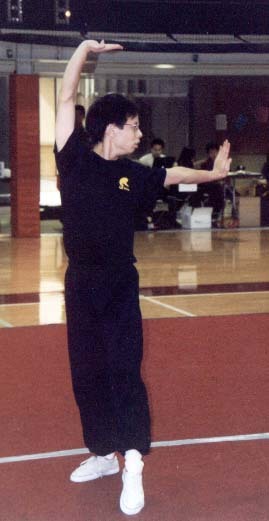 This year's competition was hosted by the Stanford University Wushu club, coached by Phillip Wong and Zhang Hong Mei. A total of 75 competitors participated, representing 13 different universities including Stanford, UC Berkeley, University of Oregon, UC Irvine, Cal State Fullerton, University of Wisconson, UC Riverside, UCLA, Cal Tech, University of Arizona, Santa Clara University and Cal State Sacramento. The location was key for the success of this event. The Bay Area is not only home to two of the largest wushu programs in the US, but it also easily reached by competitors from across the Southwest and Pacific Northwest. The UC Berkeley Wushu Club, the nation's oldest and largest wushu program demonstrated the breadth and depth of its skill by fielding 30 competitors participating in over 75 events. A large portion of the success of the Cal Club is due to the tireless efforts of Coach Li Jing. In addition to individual competition, the key feature of the event is the team competition, where teams of six students represent their school in individual events and in group set competition. A total of six teams entered, two from Stanford and four from UC Berkeley. The competition was stiff, with UC Berkeley winning the team event for the third year in a row, taking first, third, fourth and fifth places, while Stanford's team's took second and sixth places. The Stanford club has undergone phenomenonal growth since its was recreated only a year and a half ago. In addition to hosting the tournament, they not only fielded 15 competitors and two teams, but also Stanford Senior Janet Hsu captured the women's All-Around championship. Upon completion of the competition, the Pacific Wushu Academy presented a school demonstration which including performances by 4 of the 8 current US Wushu Team members. Along with special performances by the Stanford Wushu Club, the Lily Lau Eagle Claw Academy and former Beijing Wushu Team member, Li Jinheng, who demonstrated his world famous rope dart. The UC Berkeley Wushu club would like to thank the Stanford Wushu Club and all the participants for making this event happen, and we hope next year's Intercollegiate Wushu Championship is an even bigger success. Darren Hsiung, Electrical Engineering Grad student busts out some Changquan. 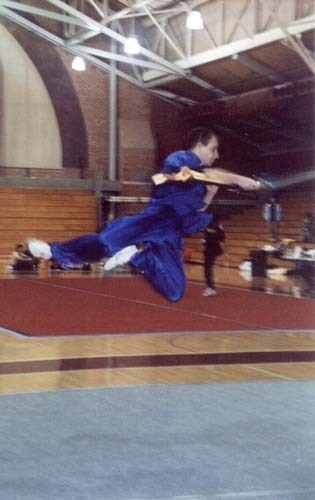 Raffi catching air with the broadsword. 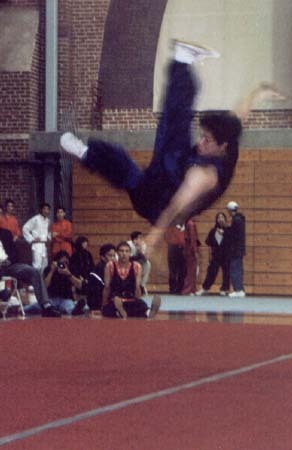 Captured midair between the forward and backwards thrusts at the end of the second section of the Compulsory form. Graduating Senior Elan Hom goes out with a bang in Nanquan. EECS Graduating Senior, Dennis Wong takes first in Men's Advanced Broadsword. UC Berkeley's Team Oski took first place in the Team Competition.